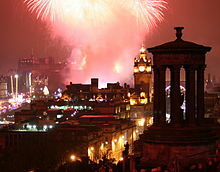 Edinburgh's Hogmanay is the observance of Hogmanay—the Scottish celebration of the New Year—held in Edinburgh, Scotland. The annual Hogmanay celebration was originally an informal street party focused on the Tron Kirk in the High Street of the Old Town. Since 1993, it has been officially organised with the focus moved to Princes Street. In 1996, over 300,000 people attended, leading to ticketing of the main street party in later years up to a limit of 100,000 tickets. In 2003–04, most of the organised events were cancelled at short notice due to very high winds. Similarly, the 2006–07 celebrations in Edinburgh were cancelled on the day, again due to high winds and heavy rain. Hogmanay is the Scots word for New Year's Eve. In Scotland, New Year's (Hogmanay) is celebrated with several different customs, such as First-Footing, which involves friends or family members going to each other's houses with a gift of whisky and sometimes a lump of coal. The Edinburgh Hogmanay celebrations are among the largest in the world. Celebrations in Edinburgh in 1996–97 were recognised by the Guinness Book of Records at the world's largest New Year party, with approximately 400,000 people in attendance. Numbers have since been restricted due to safety concerns. Edinburgh, the Scottish capital, hosts one of the world's most famous New Year celebrations. The celebration is focused on a major street party along Princes Street. The cannon is fired at Edinburgh Castle at the stroke of midnight, followed by a large fireworks display. Edinburgh hosts a festival of four or five days, beginning on 28 December, and lasting until New Year's Day or 2 January, which is also a bank holiday in Scotland. Other cities across Scotland, such as Aberdeen, Glasgow and Stirling have large organised celebrations too, including fireworks at midnight. ^ "Hogmanay-the Scottish New Year". BBC. 10 May 2006. Retrieved 13 January 2011. ^ "Weather spoils Hogmanay parties". BBC News, Scotland. 21 December 2007. ^ "Hogmanay 2015: what is it and where can I join the celebrations in Edinburgh, Glasgow and the rest of Scotland?". Daily Telegraph. 31 December 2015. ^ "The Stoats Loony Dook - brought to you by the Porridge Pioneers". EdinburghHogmanay.com. 1 January 2016. ^ "Thousands enjoy Hogmanay celebrations across Scotland". bbc. 1 January 2016. Wikimedia Commons has media related to Hogmanay. This page was last edited on 21 June 2018, at 15:42 (UTC).